Bow, black powder, or rifle! Come hunt our bear management area which is comprised of over 650 square kilometers of mature conifer stands mixed with berry-rich new growth forest. We offer 6 day hunts in both Spring and Fall for varying party sizes. If you have the Hunting Version of an Ontario Outdoors Card, you can buy your hunting license online or at any participating license issuer. Follow the link below to buy your license online and make sure to print a copy for your pocket. If you have not previously purchased a hunting license in Ontario or do not have the Hunting Version of an Ontario Outdoors Card, you must provide a license issuer an original or certified copy of acceptable hunting accreditation (i.e. previous rifle hunting license). Ontario will not issue a hunting license without seeing a hunting license (past or present) showing proof of previous hunting experience. If you are bringing a firearm into Canada, you need to fill out a Non-Resident Firearm Declaration form prior to entering Canada. The link below provides access to the form as well as other information regarding firearms in Canada. 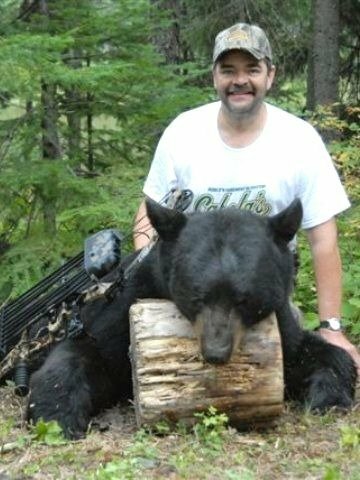 Brent Williamson, owner and guide, has 25 years of hunting and guiding experience in the Ear Falls area and is more than happy to answer any questions you might have. Call us today – we will coordinate all of the details with you for a memory of a lifetime!